The complement is the amount you must add to something to make it "whole". For example, in geometry, two angles are said to be complementary when they add up to 90°. One angle is said to be the complement of the other. 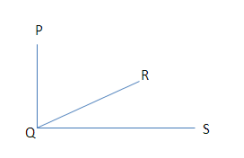 In the figure below, angles PQR and RQS are complementary.